“Hey! Hey! Hey! 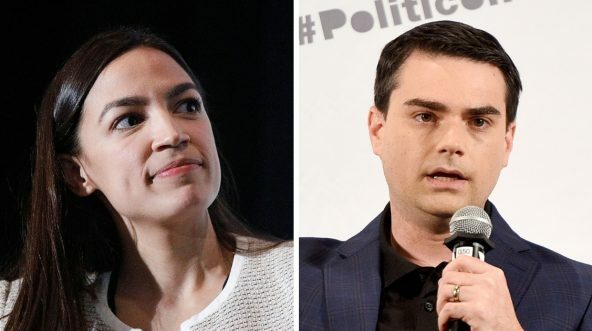 That’s unacceptable,” she told an audience member who had heckled former Rep. Bob Inglis, who expressed some concerns over Ocasio-Cortez’s Green New Deal. Yes, she used the moment to point out that “that’s the difference between me and Trump,” but it almost evinced some maturity from the Green New Deal architect who once said she was “the boss” on the issue because Republicans hadn’t come up with a comparable plan. But then, she used the clip to take one of the most ill-advised victory laps we’ve ever seen. “Let’s debate, not debase,” she tweeted Friday, along with a peace sign emoji. You may perhaps see where this is going. See, back during her 2018 campaign, Ocasio-Cortez basically refused to appear in any venue where she wasn’t treated with kid gloves. Her one major adversarial outing, on Margaret Hoover’s reboot of “Firing Line,” resulted in the infamous answer, “I am not the expert on geopolitics on this issue.” Generally speaking, however, she spent the campaign in friendly environments like Stephen Colbert’s late-night show. So, when conservative pundit Ben Shapiro challenged her to a debate — and offered to make a $10,000 donation to her campaign or a charity of her choice — she initially ignored it, before suggesting he was sexist for even bringing it up. You’ve literally turned down every invitation for debate that’s been offered to you & instead debase the entire right everyday on Twitter as bigoted & hateful. But, sure. This is the invariable problem with Ocasio-Cortez’s career in politics thus far: What she says sounds wonderful until it comes under any sort of scrutiny. The Green New Deal was the best example of this — a medley of liberal good intentions and bad ideas that would have essentially done nothing for the country or the environment if it even had a chance of getting off the ground in the first place. But the media loved the Green New Deal until even they had to acknowledge it was never going to become law. And that’s the major difference between Ocasio-Cortez in theory and in practice. She says she wants debate — just not not debate from anyone who isn’t a minor congressman who got voted out of office in the 2010 midterms, someone brought on by MSNBC to curate the appearance of balance. Well, if Ocasio-Cortez is interested in a real debate, then Shapiro’s waiting. I’m sure the $10,000 offer still stands. If she wants debate, she can certainly have it. Otherwise, perhaps she may want to be more careful with her victory laps.